3DS, BMP, CUR, DDS, EMF, FON, GIF, ICO, IFF, JPG, LWO, PCX, PNG, TGA, TIFF, TTC, TTF, WMF. MID, MOD, MP3, OGG, S3M, WAV, XM. 3GP, ASF, AVI, BIK, DAT, FLC, MOV, MP4, MPG, MPQ, SMK, SWF. 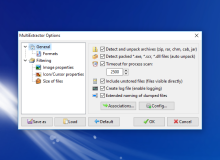 Even if file is without ZIP, RAR or CAB extension MultiExtractor can detect this file and decompress it for data extraction. MSI (Microsoft installer), JAR, Office files (as ZIP), CHM (HTML HelpFile). MultiExtractor can detect packed executable and DLL files. There is a general detection algorithm that works on UPX and other packers. After detection process is loaded into memory where data is extracted. You may command to process unpacking by "force unpack" in extract mode window. MultiExtractor can process files with ZLIB compression, in "ZLIB Stream Unpack Mode" it is possible to find ZLIB Strems, uncompress them, join them after that and scan for valid database data. There is possible to extract / recover some important data / files from corrupted TIB Archives. If there is no way to mount your Acronis TrueImage TIB File, MultiExtractor can help in data recovery from your Acronis TrueImage Backup. MultiExtractor can extract pictures from SlideShows. There is a special support for Photodex Proshow SlideShows and other SlideShows. With "Memory Scan Loop" option it is possible to extract / recover photos stored in your SlideShow. MultiExtractor supports extraction of icons from ICL (Icon Library). You may choose what icons should be extracted (size / dimensions, quality) by using filtering options. You may also convert them to PNG (with true color), GIF, BMP, JPG. With MultiExtractor and his options you may filter files based on their FILE SIZE, PICTURE DIMENSIONS (pixels), QUALITY (Bits Per Pixels). 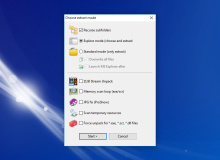 You may also define file extensions to scan or exclude it. MultiExtractor can Convert Images with easy and comfortable method. By setting "View as" option you may set output view as file (after saving). It is possible to set "view as" to: ICO, BMP, JPG, PNG, GIF... You may convert PNG to ICO and ICO to PNG with full transparent support (TRUE COLOR). MultiExtractor can patch data (not available in DEMO version). You may drag the source file on the "data to patch" and after that patch it. Data size must be less or equal to size of target data. All self-proclaimed computer specialists need to know how to take a PC apart and study it carefully. While this rule generally applies to the hardware part of a computer, it's also useful to learn how to extract files and export their components. 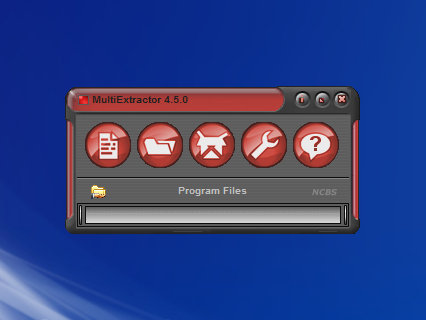 MultiExtractor is such an application, created to thoroughly analyze files. This tool allows users to 'look' into files and folders, explore and extract hidden elements, such as images, audio, video, icons, and textures, all from within a minimalistic and easy-to-use interface. First the source needs to be selected, either a file or a folder, it gets extracted, then the tool quickly analyzes the source and displays the results. Considering MultiExtractor recognizes a wide range of formats, users can also choose the type of files that should be processed, thus reducing the time it takes to complete an extraction. They can even filter the size of the image that need to be dealt with, depending on their preferences. There are plenty of settings that can be configured to filter searches, such as recurse subfolders or overwrite files. Moreover, the software uses the CPU memory to a minimum, therefore it does not affect its overall performance. What can be done with this software? Users can break files apart and use a particular piece to specific purposes. The software can also be used as a method for learning what is hidden within various applications. Other than that, it can also be a fun tool, handy for poking around files on one's PC. If MultiExtractor's file-extracting capabilities (and stiff price) are more than the average user needs, it could be the answer to many pro user's needs. 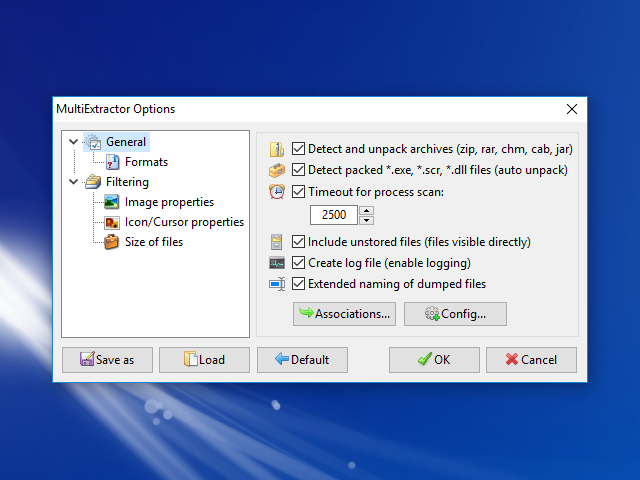 MultiExtractor extracts icon, image, audio, video, texture, and similar files, including zipped, hidden, and encrypted files, from deep inside a wide range of programs, drivers, and other software resources. You merely need to choose a file or directory and let MultiExtractor comb it for each type of file you're after. MultiExtractor displays results in a variety of customizable views so you can be sure you've hit the target. It also decompresses files and maps data. When it opens, MultiExtractor's main window is as small and stylish as a media player, and just as re-skinnable. Basic operation couldn't be easier: Select a file or directory to extract, and then press "Extract." We ran MultiExtractor on a random executable. A pop-up let us choose extraction mode: Explore (choose and extract) or Standard (extract), plus options such as Memory scan loop and Recurse subfolders. We pressed "Start," and MultiExtractor quickly returned two things: A Control Panel with a detailed, tree-view-based scan summary, including file size ratio graphs. MultiExtractor has more features, such as sophisticated filtering for faster, targeted extractions. 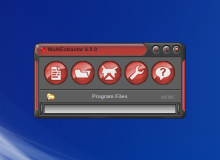 MultiExtractor is a powerful yet easy to use application that allows you to manage your graphic files and convert them to different formats in just a few simple steps. The supported picture, audio, video formats are the following: BMP, JPG, GIF, PNG, PCX, TGA, ICO, CUR, TIFF, EMF, WMF, XM, MOD, WAV, OGG, MP3, MID, S3M, AVI, among many others. This incredible program has the ability to extract files stored on Microsoft® Office files, Portable Document Format, Databases, raw or binary files (like *.doc, *.docx, *.ppt, *.pptx, *.xls, *.xlsx, *.pdf, *.db, *.raw, *.bin, *.hex, etc.) 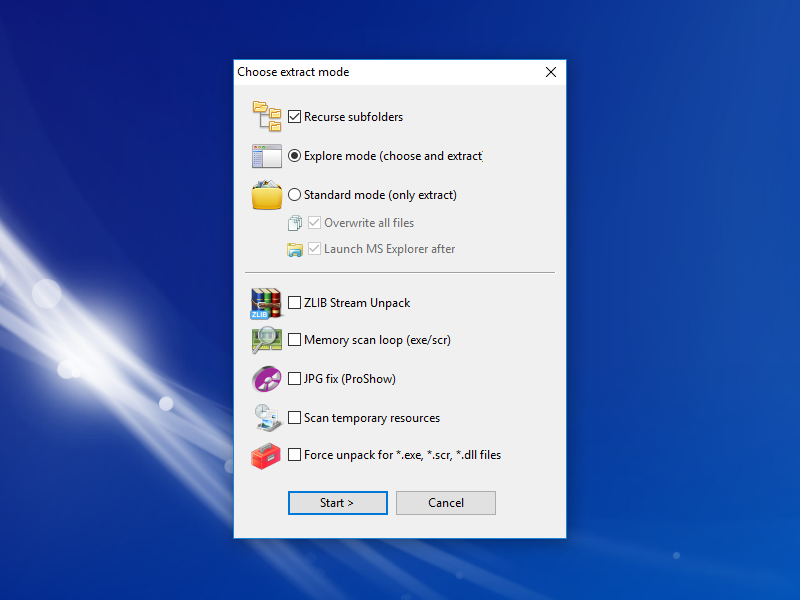 and also extract multimedia content (stored as resources or binaries ) from PE files (*.exe, . *.scr, *.dll, *.ocx, *.ax). It also decompresses archives (ZIP, RAR, CAB+InstallShield Cabinets, JAR, CHM) and extracts data from them. What is more, it includes strong filtering options such as icon properties, image properties, size of files, etc. and has the ability to extract encrypted/packed resources of executables or DLL files. Note that this version is no longer available for download but here you can get the latest one which includes even more improved features.